It was going to be a hot day, and we wanted to take Bryden someplace he could cool off. 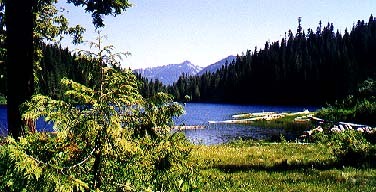 We choose the Talapus-Olallie Lake trail, but only made it as far as Talapus Lake - what a great place for kids to play and swim! The trail is gentle and pretty, and in about a mile you arrive at the south shore of the lake. Talapus Lake from the south shore There's a path travelling around the eastern shore, with several side paths down to the lake shore itself, some providing better access than others. We found one about midway along the eastern shore that had a large rock just under water level that was perfect for Bryden to wade on - the water must have been in the mid 60's, and he had a blast! 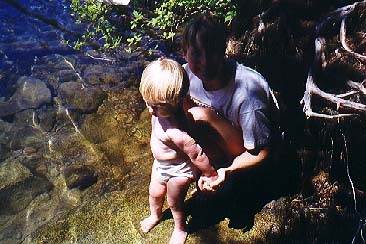 He slipped off the rock once, and submersed himself completely, but other than a quick hug from mom he seemed none the worse for it. We decided it was time for him to get out when he was full body shivering, but even then he put up a little fuss, being certain he wasn't ready to get out yet! We followed the path all the rest of the way around the eastern shore to the north end of the lake, and found two other prime lake access spots, one about 4/5 of the way up the shore and the other almost at the north end of the lake. 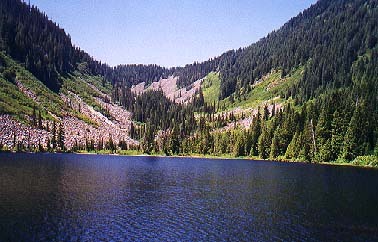 If you're looking for a great lake to take the kids swimming, and jump in for a quick skinny dip yourself, Talapus Lake is a great destination!